Home / Parking Matters Blog / Embracing Parking Tech? How Presidential. Embracing Parking Tech? How Presidential. South Dakota isn’t known as a hotbed of traffic problems, at least until you get to Keystone. 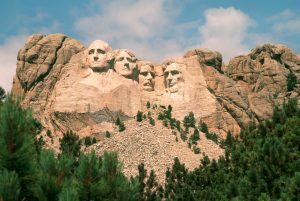 Its famous Mount Rushmore National Memorial has suffered from snarled roads and slow exits and entrances for some time. And now they’re addressing it the way parking professionals already knew would work: with automated parking pay stations and space-indicating wayfinding signs. Park visitors will be able to follow signs into the gates that show them how many spaces are available in each parking area. And instead of paying for parking at booths on the way out of the lot, park visitors will now pay at pay stations and use their receipts to exit. Officials hope the move will help clear lines and get people moving again, especially during the summer. Our folks might say it’s a monumental day (see what we did there?) at Mount Rushmore. Read the whole story here.